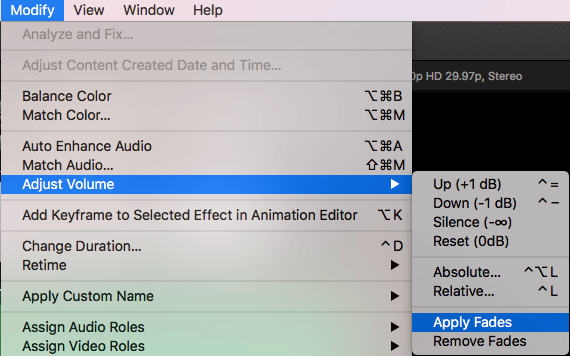 Part 1: Use the Modify Menu You can go to the Modify menu and easily apply fade-in or fade-outs to the audio clip you are editing. 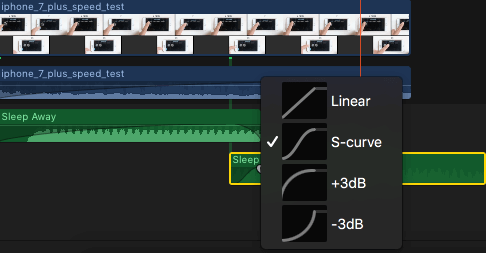 The Final Cut Pro preferences also allow you to adjust the fade duration. Part 2: Use Fade Handles You can manually fade-in or out a portion of the audio clip on your timeline by using the fade handles. Place the pointer over the clip and you can see the fade handles appearing in the top left and right corners of the waveform. To change the sound of the fade, you'll have to modify the shape of the fade by selecting one of the several preconfigured choices. This tutorial offers only the basics of the audio fading techniques in Apple Final Cut Pro X, which is a specialized video editing software used by professionals worldwide. If you are an amateur who is new to video editing, we suggest you begin with Wondershare Filmora for Mac (originally Wondershare Video Editor for Mac). It is a powerful yet easy-to-use software which is ideal for beginners. You can download the free trial version of Wondershare Filmora below. With this modern and extremely user-friendly tool, you'll find that applying effects like fade-in, fade-out, or crossfade to your audio clips is very easy. Before we get started, you can firstly detach the audio from video to better edit it. Locate your audio clip in the timeline, highlight the desired audio/video clip, right click on it, and choose Detach audio to unlink your audio from your video to edit them as separate elements. Check more articles here, if you are also interested in other audio editing tips in Final Cut Pro or want to know how to record a voice over with FCP. Step 1: First, you have to select the audio or the video clips with audio in the timeline. Step 2: Select Modify> Adjust Volume> Apply Fades. You must remember that the fades appear at the beginning and the end of each clip. The default duration of the fade is one half-second. If you want to modify that duration, you just have to drag the fade handle up to the point where your fade is supposed to begin or end. Step 3: If you want to remove the fades, choose Modify > Adjust Volume > Remove Fades. You have already learnt how to find the fade handles on the screen. Now, you just have to manually drag the handle to the exact point from which you want the fade to begin or end. Just keep in mid this simple rule: fade handles at the beginning of a clip produce fade-in effects, whereas fade handles at the end give fade-out effects. Step 1: To create a crossfade, first you have to select two adjacent clips in the timeline. After that choose Clip> Expand Audio (or press Control-S). You can see the waveforms on your screen expanding. Step 2: To overlap the audio parts of the two clips on your timeline, just drag the end point of the first clip and the start point of the second clip. Step 3: Now, you'll have to drag the fade handles of each clip to the exact points where you want the fade to start and finish. You can easily change the sound of your fades by modifying the default fade shape. For this, you'll have to control-click a fade handle and select one of the fade preferences from the list. Linear: The rate of change is constant over the length of the fade. S-curve: Eases in and out of the fade with the midpoint at 0 dB. +3dB: Picks up quickly and then gradually peters out toward the end. This is the considered to be the most useful mode while choosing a quick fade. –3dB: Begins slowly and then toward the end picks up fast. This setting allows you to maintain a perfectly natural volume while crossfading two clips. Linear: Maintains a constant rate of change over the length of the fade. +3dB: Starts quickly and then slowly tapers off toward the end. This is the most useful setting for quick fades. –3dB: Starts slowly and then moves quickly toward the end. This is the default setting and is best for maintaining a natural volume when crossfading between two adjacent clips.